On World Biofuel Day, Prime Minister Narendra Modi fuelled a hope. “India can save Rs 12,000 crore in foreign exchange in the next four years due to ethanol blending in petrol,” he said at a time when the country’s crude import bill has touched Rs 8 lakh crore. Union Road Transport Minister Nitin Gadkari has also been harping on the importance of alternative fuels. During a recent visit to Charoda in Chhattisgarh’s Durg district, he said the state has immense potential for biofuel, referring to India’s first biofuel-powered flight from Dehradun to Delhi on August 27 that used oil from jatropha (Jatropha curcas) seeds in Chhattisgarh. While Gadkari has been lobbying for biofuel ever since he assumed office in 2014, his advocacy is seen with suspicion, given his long association with the sugar and ethanol industry. His latest hypothesis that Chhattisgarh could emerge as a biofuel hub echoes Chief Minister Raman Singh’s 2003 slogan, “Diesel nahin ab khadi se; diesel milega ab baadi se” (Diesel will no more be imported from the Gulf; it will be produced in the backyard). Years later, people realised it is not the “green gold” that it was made out to be. Singh’s claim that by 2014 the state will be self-sufficient in biofuel production never came true. “One million people were supposed to get employment. However, the plan for establishing biodiesel industry did not take off. We are still buying fuel at Rs 85 per litre,” says Tulsiramji Sahu, former sarpanch of Seoni Khurd in Dhamtari district. Lokdhar Sahu, a resident of Bhothli village in Dhamtari district, where the government had planted jatropha on 20 ha, says plantations affected paddy crops as they cut off sunlight and did not let rice grow. 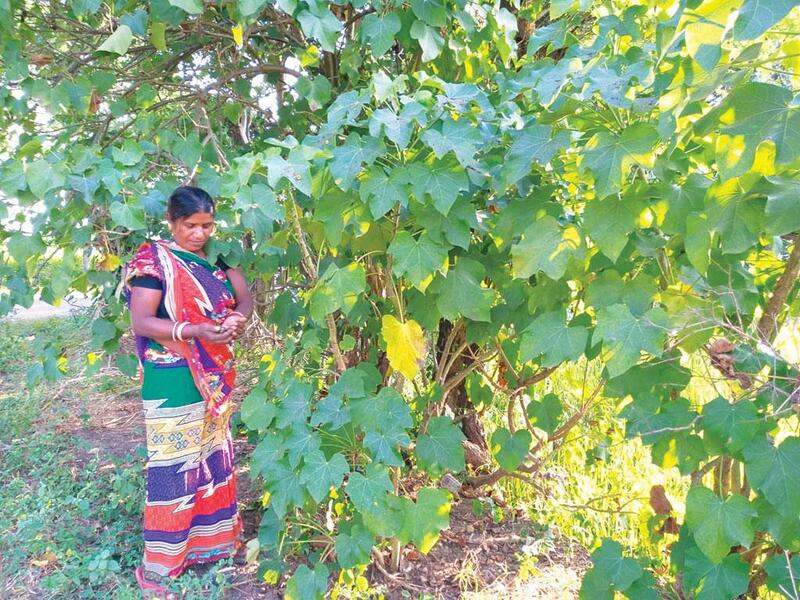 Both the Centre and states had identi fied jatropha as “the most suitable tree-borne oil seed for biodiesel in view of its ability to thrive under a variety of agro-climatic conditions, low gesta tion period and higher seed yield”. However, this optimism was based on misunderstanding. “As jatropha is a resilient crop, it was planted on unproductive soils. Though the plant can survive droughts and infertile soil, it can’t produce many seeds under those conditions. To get a good harvest, it needs nutrients and water, just like any other crop,” says Charmaine Sharma, partner at Observing-i Ecotech LLP, Gurugram-based green technology firm. Even its gestation period of four years cannot be considered “low”. In 2012, a critical review of biodiesel promotion policies in India pointed out that unavailability of land dampened the prospect of large-scale cultivation of jatropha. The plantations also led to environmental problems. In Andhra Pradesh, they led to acidification, ecological toxicity, eutrophication and water depletion. Under the National Biodiesel Mis sion, launched in 2009, jatropha and pongamia (Millettia pinnata) were planned on 500,000 ha over five years with a cost of Rs 1,500 crore. Though petroleum companies signed memor anda of understanding with states to establish jatropha on government-owned wastelands or through contract farming with small and medium farmers, the yield was low. Due to the lack of commercial viability, three oil marketing companies—Indian Oil Corporation, Bharat Petroleum Corp- oration and Hindustan Petroleum Corporation—shut down the joint ventures they had started for jatropha cultivation to manufacture biodiesel. It partly explains why India has been missing biofuel blending dead- lines ever since the erstwhile Planning Commission in 2003 recommended launching of a national biodiesel mission to follow the mandate of 20 per cent blending of biodiesel with diesel by 2017. Now, even the revised target—5 per cent blending by 2030—looks ambitious given the lacklustre progress so far. Biodiesel blend in 2017 was less than 0.12 per cent “mostly due to limited feedstock availability and lack of an integrated and dedicated supply chain”. To expand the market by 2022, India needs 6,750 million litres of biodiesel and 4,500 million litres ethanol per annum. Government data shows ethanol production in 2017-18 was 1,410 million litres. The National Biodiesel Mission, says Sandeep Chaturvedi, president of Biodiesel Association of India, did not yield results as there was no roadmap in place. The approach towards jatropha plantation was not scientific and farmers lacked technical knowledge on cultivating jatropha. There was also no mechanism for collection. Despite this, Chhattisgarh government believes that jatropha-based biodiesel project hasn’t lost its sheen. “The programme has unduly attracted negative publicity. We have to understand that these jatropha plantations were initiated as part of rural income generation schemes, and that purpose has been solved. Even today, 105 farmers came to sell the seeds,” says Sumit Sarkar of Chhatti sgarh Biofuel Development Authority. But others are not convinced. “I do not see merits in reviving jatropha for biofuel. Since its leaves and fruits are poisonous, it can be used as hedges around crops to deter animals from damaging them,” says Sharma. Some experts apprehend a diffe rent crisis. “Biofuels cannot go very far in our country. Rice and wheat straw, cotton stalk, cane trash and corn cobs; and the land used for jatropha have alternative uses that will be hit by encouragement to biofuels,” Bharat Jhunjhunwala, former economics professor at the Indian Institute of Management-Bangalore opined in a commentary. Alok Shukla of non-profit Chhattisgarh Bachao Andolan, too, believes that increased demand for fodder crops for biofuel diverts the attention away from food and feed sectors. Biofuel, he says, does not work in India where land availability is low. “Certain sugar companies in Nagpur, Gadkari’s hometown, are pushing for increasing production of ethanol from sugarcane. Gadkari should be aware of them. We have limited land and water. If we use them for ethanol, then we will have to import more food. It is better to depend on imported energy than on imported food,” Jhunjhunwala says. (This article was first published in the 16-31st October issue of Down To Earth under the headline 'Pitfalls outweigh potential').